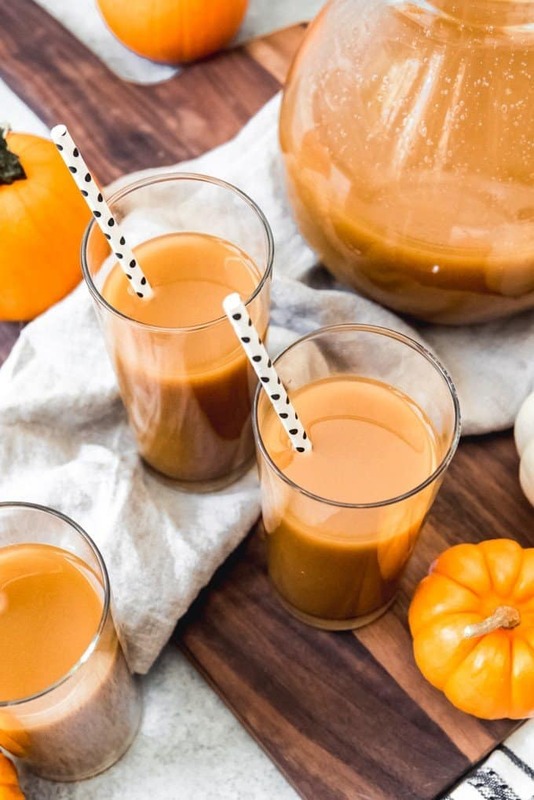 This easy homemade Harry Potter inspired Pumpkin Juice is the most popular non-alcoholic beverage in the wizarding world and it’s a must for the Fall season! 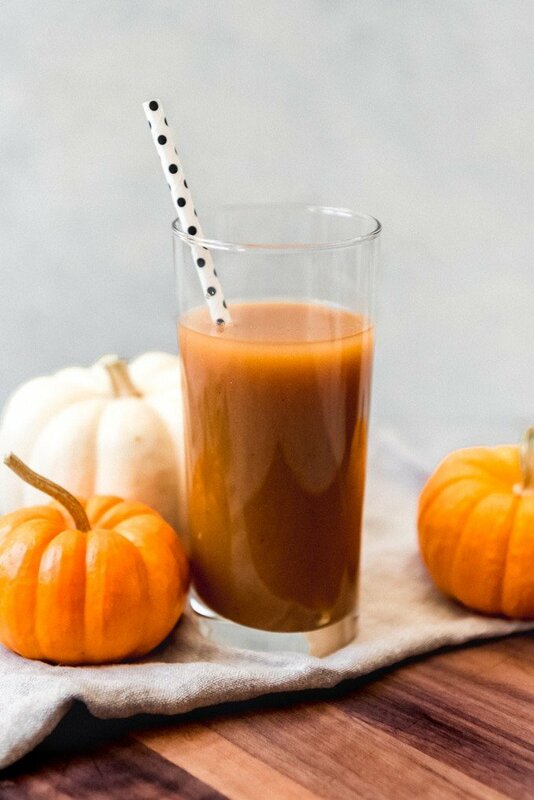 Made with real pumpkin, apple cider, and warm and cozy spices for a delicious drink that is sure to delight wizards, witches, and muggles alike! I don’t know about where you live, but here in my part of California we are definitely noticing that the nights are getting a little cooler and even though the days are still warm, they’ve lost the intensity of summer. Which means my favorite season of the year is right around the corner! I love, love, love Fall. Sweater weather, pumpkin patches, hayrides, donuts and trick-or-treating all just make my heart sing. It doesn’t hurt that I have an October birthday either. For me, THIS is the most magical time of the year! 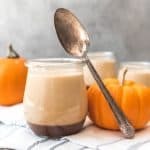 So while I’ve shared both sweet and savory pumpkin recipes this week, I thought it would be fun to share a pumpkin-forward beverage with you as well so you can have this recipe to celebrate Halloween, Thanksgiving, or just for no reason at all this Fall. 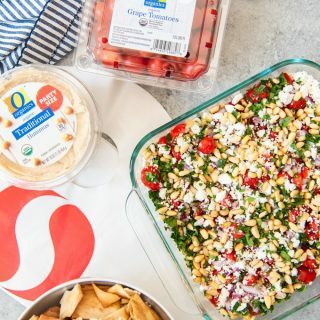 I have made this for class parties and it was a big hit with my kids who love when there is a pitcher of pumpkin juice in the fridge. 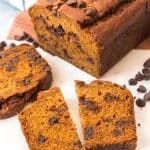 Be sure to scroll to the bottom of the post for more pumpkin-inspired recipes, and go visit this post to enter the Pumpkin Week giveaway! Don’t be scared away by the idea of drinkable pumpkin. 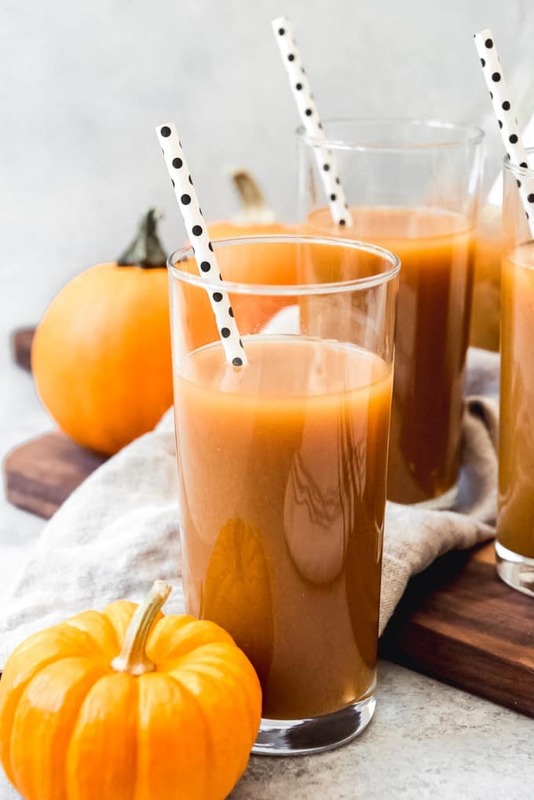 The flavor of pumpkin juice is really mostly apple cider and pumpkin spice with hints of pumpkin and apricot that give it a really full-bodied and smooth appeal. 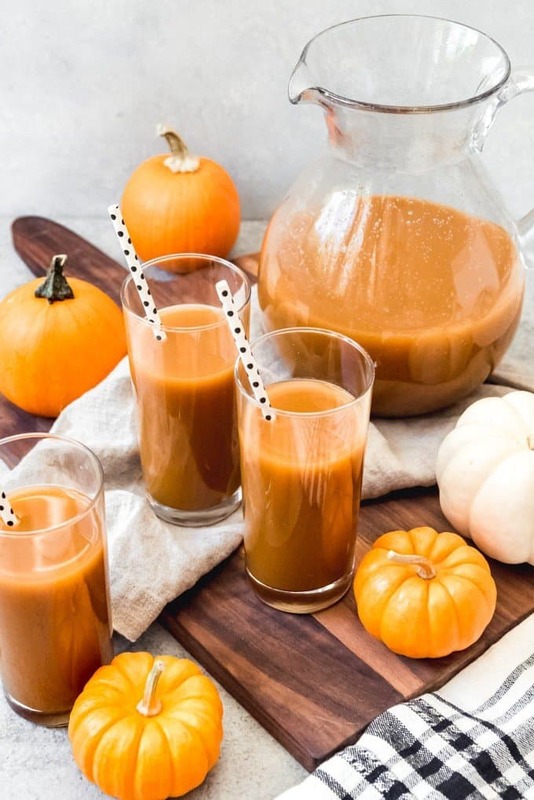 Start a new tradition this year by making a batch of pumpkin juice to enjoy with some popcorn and watch the Harry Potter Movies. Or better yet, re-read the books! I love listening to them on Audible. In the Harry Potter books, pumpkin juice is mentioned in all but the first book in the series as one of the most popular wizarding beverages (the other being butterbeer, of course). It is served in the Great Hall at Hogwarts School of Witchcraft and Wizardry and on the Hogwarts Express snack trolley. This is one magical treat that you are going to love! It’s so simple to make this fall beverage at home. 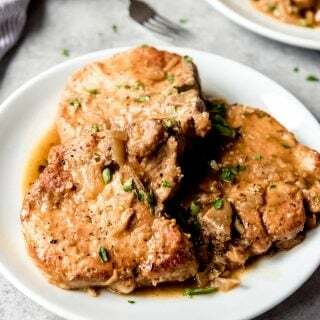 Just stir all of the ingredients together in a large pot on the stove and let it simmer for a bit to allow the brown sugar to dissolve and the flavors of the other ingredients have time to really blend together. I’ve tried this before just blending the ingredients without heating them and you just don’t get the same smooth, unique flavor that comes from allowing the heat to unite all the flavors into something more than just amped up apple cider. 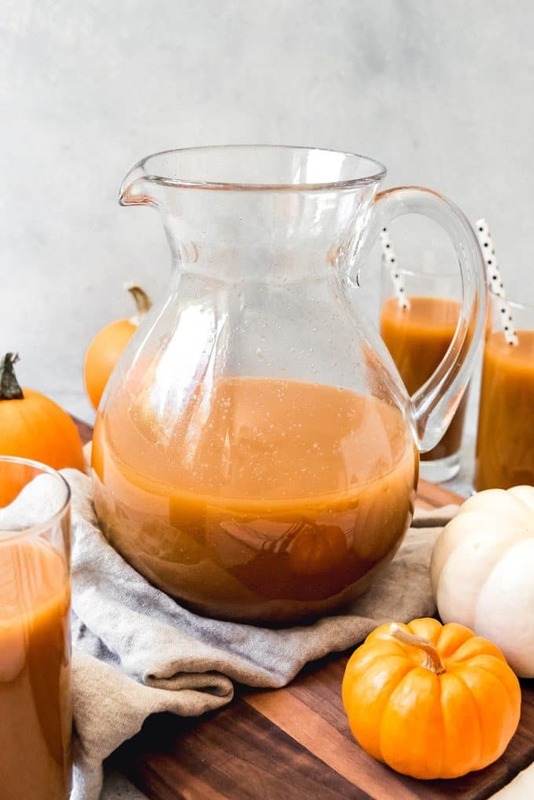 Pumpkin juice is always served cold in the Harry Potter books, and that’s definitely my preference as the flavor deepens as the pumpkin juice cools and has a chance for the spices, cider, and pumpkin to meld. But you can certainly serve it warm if you’re looking for an extra cozy beverage to sip on chilly nights when dry leaves are blowing across the ground outside. Adding the brown sugar is optional and some might think that the pumpkin juice is sweet enough on it’s own from just the cider and apricot nectar (or whatever fruit juice or nectar you have available to you). But I think adding a small amount of sweetener actually helps bring out the pumpkin flavor just a little bit more. 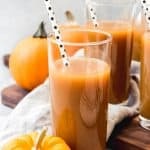 This easy homemade Harry Potter inspired Pumpkin Juice is the most popular non-alcoholic beverage in the wizarding world and it's a must for the Fall season! 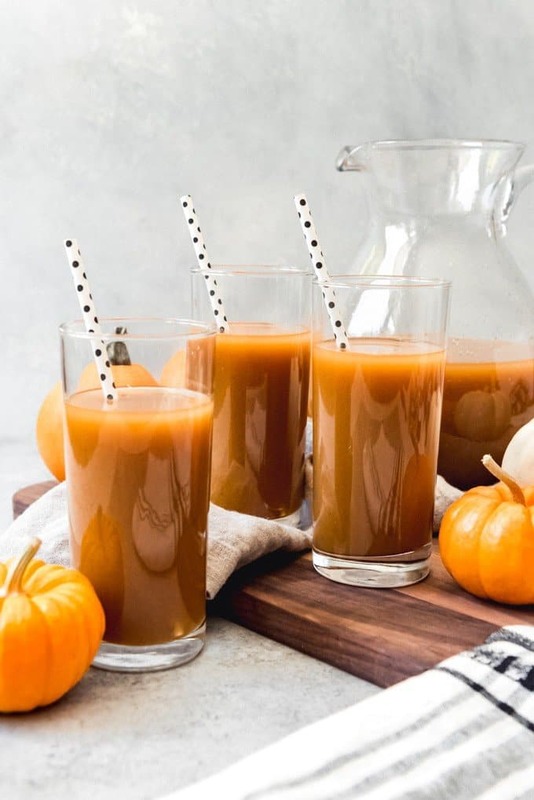 Made with real pumpkin, apple cider, and warm and cozy spices for a delicious drink that is sure to delight wizards, witches, and muggles alike! 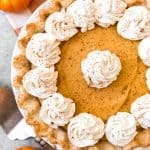 Combine all ingredients except vanilla in a large pot over medium heat on the stove and heat just until the pumpkin juice starts to boil then reduce the heat to low and simmer for 10-15 minutes. Remove from heat and stir in the vanilla, then allow to cool completely and chill before serving over ice or re-heating to serve warm. 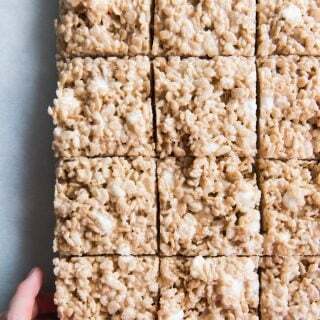 I’m going to miss my daily dose of Harry Potter recipes. Oooh this sounds right up my street I love pumpkin anything. P.S I love those straws! Oh man, this sounds so fun! I’ve seen the Harry Potter movies, but I’m not big into the whole thing, so I didn’t realize that pumpkin juice was a thing in the books! I would totally try this!